Quad band: GSM 850/900/1800/1900  Tri-band UMTS/HSPA  GRPS Class 12; CS1-4  EDGE Class 12; CS1-4; MCS 1-9  CSD 9.6 kbps  UMTS/HSPA  WCDMA UL/DL 384kbps  EDGE UL/DL 236.8Kbps  GPRS UL/DL 85.6 Kbps, CSD 9.6Kbps  V.32 analog modem*  PBX Connectivity  GSM Supplementary services  Short Messaging Service (SMS)  Remote Management (optional)  RJ11 Interface, max 600 m, up to 3 devices can be connected in parallel  USB 2.0 interface. 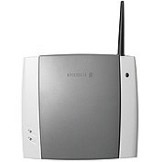 Replacement for the Ericsson F251M The I36 terminal - is the natural choice for the small office communication needs. It offers businesses a highly cost efficient and flexible solution utilizing an existing GSM network. Especially in locations that lack fixed communication infrastructure. This state-of-the-art GSM terminal with integrated design for high quality and performance support the latest deployed communication standards. The I36 terminal offers voice, data and fax capabilities and PBX connectivity that enables substantial cost savings by turning fixed-to-mobile into mobile-to-mobile calls. With the crisp voice quality equivalent to that of a standard fixed line, high-speed data connectivity for Internet access with "Always connected" capability, multifunction fax support and PBX connectivity using a single telephony interface the I36 terminal is the definitive terminal for business needs. An integrated analog modem is also an essential feature of the I36 terminal. Thanks to the integrated analog modem the I36 terminal can be located up to 600 meters from, fax and PC equipment thus giving the business user(s) freedom of flexible location. With the I36 terminal you have access to both fixed and wireless services. This opens up new possibilities to offer services that normally are not available to businesses using fixed lines. Amongst the services available through the GSM network are; Prepaid subscription, Calling Line Identification, SMS service and more. Thanks to the simplicity of the I36 terminal, the installation can be carried out with ease. The I36 terminal features Remote Management capabilities that enables monitoring and management of the unit from a location of your convenience. Features: - G36e dual - band GSM900/GSM1800 - RJ11 Interface, max 600 m, up to 3 devices can be connected in parallel - EDGE, multi-slot class 10 (4+1 or 3+2), up to 236.8 kbps- GPRS, multi-slot class 10 (4+1 or 3+2), up to 86.2 kbps- CSD, up to 9.6 kbps - V.42bis data compression - V.90 analog modem - PBX Connectivity - CLI, ETSI DTMF & V.23, Bellcore FSK - GSM Supplementary services - Analog Group 3 fax - Remote Management (optional) In the Box: - I36e unit - AC/DC Power supply - Telephone cable - Wall mount kit - Standard antenna - User guide - Quick guide - now manufactured by Owasys. Ideal solution for a mobile office or keeping in touch whilst you are off shore. The DC-072 acts like a fixed line alternative/replacement for broadband Internet. THIS PRODUCT IS COMPARABLE WITH THE ERICSSON W25 BUT AT A MUCH LOWER PRICE! CellFax 3G is a fully featured terminal that allows major network operators to provide a viable alternative to Fixed Line Connections by offering their customers Fixed Wireless Access to Voice, Fax, SMS and Data. CellFax 3G provides users with high quality voice using EFR (Enhanced Full Rate) and AMR (Adaptive Multi Rate) codecs, the ability to reliably Send and Receive Faxes using a standard Analogue Group 3 Fax Machine and provides High Speed Data Access for Email and Internet access. The CellFax 3G can be self-installed by the end user, making the provisioning cycle simple and reducing costs for the network operator. 2N SmartGate is a single-channel Analogue GSM gateway, which provides a number of services for cost efficient way of communication. It is intended for small size companies and households and its main objective is to save the users a lot on GSM call costs. 2N SmartGate can be connected to a PBX, to a standard telephone set or to PC (LAN) and can be used for Voice, Data through GPRS, SMS and G3 Analog Fax transmission (optional). This unit is configured using an RS-232 Serial connection to PC or Laptop. Please see 2N SpeedRoute as direct replacement alternative.